From left, White House press secretary Sarah Sanders, national security adviser John Bolton, FBI Director Christopher Wray, Director of National Intelligence Dan Coats and National Security Agency Director Gen. Paul Nakasone listen during the daily press briefing at the White House, Aug. 2, 2018. Just hours after top U.S. national security leaders made a rare joint appearance in the White House briefing room Thursday to express concern about efforts by Russia and potentially others to meddle in upcoming U.S. elections, U.S. President Donald Trump made an appearance at a rally where he seemed to be unable to come down hard on Russian President Vladimir Putin, even in the face of the mounting evidence of Russian election interference. "I got along great with Putin," Trump said at the rally. Trump again accused the media of writing fake news, calling media reports of Russian interference in U.S. elections a hoax. The president’s rally remarks conflicted with the statements the national security leaders made earlier in the day. "We continue to see a pervasive message campaign by Russia to try to weaken and divide the United States," said the director of national intelligence, Dan Coats, adding that he is aware "Russia is not the only country that has an interest in trying to influence our domestic political environment." Coats said President Trump "has specifically directed us to make the matter of election meddling and securing our election process a top priority." 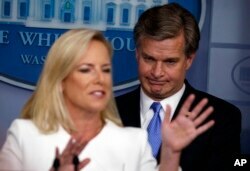 FBI Director Christopher Wray, Homeland Security Secretary Kirstjen Nielsen and Army General Paul Nakasone, who is head of the National Security Agency, also appeared at Thursday's briefing. As they spoke, a letter national security adviser John Bolton sent to five senators of the opposition Democratic Party was released outlining the Trump administration's "extensive, historic actions" taken to "ensure the integrity of our elections and defend against foreign malign influence." The letter specifically mentioned actions taken against the Russian government, companies and individuals. Russia "stepped up their game big time in 2016," said Coats, noting their activities currently were not at that level. Wray warned, however, "Any moment is just a moment before the dial can be turned up." He also revealed that FBI field offices across the country were investigating election interference, and he stated that adversaries were "manipulating news stories and spreading disinformation." The FBI director said "progress is being made" concerning foreign influence campaigns on social media networks, and that the bureau had partnered with the private sector in this effort. Top social media companies have received classified briefings so they can better monitor their own platforms, according to Wray. FBI Director Christopher Wray listens as Secretary of Homeland Security Kirstjen Nielsen speaks during the daily press briefing at the White House, Aug. 2, 2018, in Washington. Nielsen, during her turn on the podium, warned, "Our democracy itself is in the crosshairs," noting that the U.S. government had seen a willingness and a capability on the part of the Russians to hack into voter rolls, voting machines and other elements of election infrastructure. Asked whether authorization had been granted by the president to take action to counter online attacks by foreign elements, Nakasone, who also heads the U.S. Cyber Command, declined to give a direct response, saying, "We're not going to accept meddling in the election." "Clearly, the White House and Trump are under heavy pressure on how seriously they are taking the whole issue," Paul Pillar, a former senior CIA officer now with Georgetown University, told VOA. But that criticism is likely to continue. "On an issue of central importance to American democracy, that's integral to American democracy, our leader, the president of the United States, is not out in front making these statements himself," Pillar said. "I think that is a very important and significant lack." While Trump repeatedly has wavered on clearly blaming Moscow for interference in the election that he won, those at the White House lectern on Thursday left no doubt about their conclusion on Russia's meddling. Trump has said he discussed the issue with Russian President Vladimir Putin at their summit in Helsinki last month. During a joint news conference following their talks, the U.S. president sided with the Russian president's denial that Moscow had meddled in the 2016 election to try to help Trump win. After returning to widespread criticism, Trump backtracked on the comments and said he accepted the conclusion by U.S. intelligence agencies that Russia did interfere in the election. "I think the president has made it abundantly clear to everybody" in the government who oversees election security, said Bolton, that "he cares deeply about it and that he expects them to do their jobs." Special counsel Robert Mueller has been investigating Russia's election meddling, as well as whether there were links between Moscow and Trump's 2016 campaign. Trump has repeatedly referred to the probe as a "witch hunt."